WØEA Blog! : Dayton Rumors Begin! Elecraft posted this image teasing their new offering they will be unveiling at Dayton Hamvention this week. Nobody is quite sure what it is yet but it is clearly some sort of ruggedized K3 looking thing. With a little kung-fu magic, NT1K determined that the picture was taken by Elecraft engineer Wayne Burdik, N6KR, at his home in California. A number of the rumors I've seen floating around include a K3S where the S stands for SOTA, with built in APRS and SOTA database, etc. Or perhaps a K2S, a timely upgrade to the legendary transceiver that launched Elecraft's success. A fully user built radio with K3 specifications. 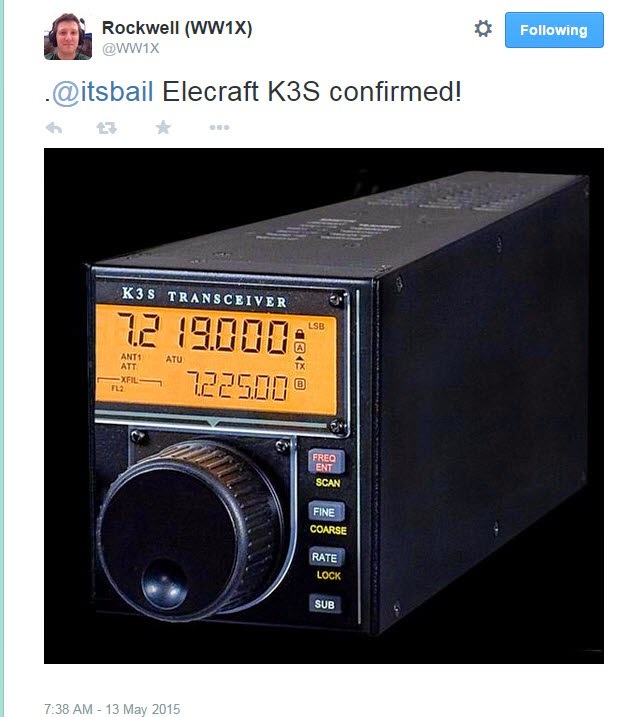 A post on the Elecraft reflector posited a handheld K3 but isn't the KX3 already almost hand-held? Whatever it is, we're all very eager to find out and you can bet I'll be updating the blog when more information is available.